The John D. and Catherine T. MacArthur Foundation has announced that a 32-year-old orangutan living at the Smithsonian National Zoological Park in Washington, D.C. has been selected for a fellowship, or "genius" award, for her unique musical abilities. The half million dollar fellowship is awarded annually to US Citizens or residents, of any age and working in any field, who show exceptional merit and promise for continued and enhanced creative work. The fellowship is not a reward for past accomplishment, but rather an investment in a person's originality, insight, and potential. A spokesperson for the foundation said, "We had to bend the rules a little in this case, since Bonnie is technically not a person, but everything else is in order." 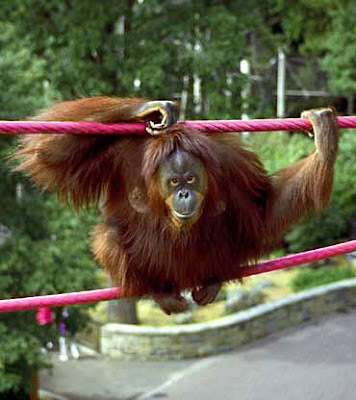 The musical orangutan has been attracting much attention as a composer of serious note, and her first works have already earned critical acclaim. The NY Times has described Bonnie's whistling as "...primitive, earthy, haunting, and a total rejection of post-modernist aesthetics." The New Yorker writes that Bonnie's tunes are "...a breath of fresh air, simply spellbinding." Her works are minimalistic (involving just one or two pitches), and explore the sonic qualities of her breathy, low-resonant whistling tone. "I go ape over this music" said a professor at Princeton University. "It opens up completely new and uncharted territory of musical exploration that we as humans have hitherto not been privileged to experience. It's the most significant event in modern music since the discovery of humpback whale song in the early 7o's." The MacArthur Foundation could not be reached for comment, but the early indications are that future foundation grants in the arts will be presented to other species in the animal kingdom. For example, several elephants residing in American zoos are under consideration for genius awards in the visual arts. Their work in acrylics is considered to be state-of-the-art and at the "cutting edge" of contemporary visual design. A spokesperson at the auction house Sotheby's (who did not want to be identified by name) said, "Animal art, of all kinds, is really hot right now."